Please read through this very important information below before contacting us by phone or email with questions or concerns. We cannot possibly keep up with all of the inquiries coming in because of the present wireless radiation issue! People contact us to share success stories, health issues from wireless exposure, or wanting EMF consulting assistance because they are confused. We care about you, however we cannot meet all of the need and demand at this time. Thank you for your understanding! Won’t Microwave Radiation Go Inside the Hats or Hood? Why Can’t I Test Your Products Using My Cellphone or RF Meter? Will Your Products Stop Ringing in My Ears? Will Your Products Help a ‘Targeted Individual’? What About the Issues Related to Grounding? Will our shielding products protect one from 5G technology? Our shielding products are the highest quality and most effective available for reasons listed below. Shielding effectiveness of our products, even at 5.8GHz (gigahertz) is still 45dB (99.995%). So although we have not gone up to 10GHz with our testing, we believe it will be the same or maybe even greater. We believe strongly that our products will shield very effectively (over 99.99%) right through to 76GHz, but of course we need to get tested and certified. Understand we are being honest with this explanation. Many products on the market, making claims regarding shielding effectiveness, are not even tested or certified to verify these claims. In addition, present 3G and 4G frequencies, and frequencies being used in many wireless devices are still going to be used for years to come. 5G is not going to replace existing technologies using 3G and 4G frequencies. Thus, these shielding products will be useful and effective for years to come. By the way, our Headnet/Modem Guard, Baseball Caps and Hats are rated at 50dB shielding effectiveness or 99.999%. When exposed to higher 5G frequencies, excellent shielding effectiveness will still exist. However the effectiveness may drop by some percentage, and we do not know what that will be yet until proper testing can be done. Why our shielding products are superior? 1) Certified and verifiable shielding capacity. Extreme high EMF Shielding (Over 45dB). This is a massive 99.995% shielding effectiveness from 200MHz to 6GHz. This will cover most existing 3G, 4G and 5G technology. 2) No toxic chemicals or nano-silver are used in the fabrics. Many EMF fabrics can contain mercury, formaldehyde, or other chemicals. Our manufacturing process is regularly audited to international standards in order to provide total quality assurance. Our fabric uses silver thread NOT nano-silver like many existing shielding fabrics. 3) Unique S-Line macro-construction enables high reflection of incoming EMF radiation. The more incoming radiation that is reflected, the lower the level of EMF is absorbed by the body. 4) Highly durable – maintains shielding levels after many washes. If non-aggressive washing powders are used our fabric will last many years. Inferior shielding fabrics can lose as much as 50% shielding protection after the first wash. Many of our customers our still wearing their protective clothing up to 5 years after purchase. 5). Conductivity of material is compatible with natural body conductivity. The human body is highly conductive, being approximately 75% water. This means using our highly conductive material is compatible with the conductivity of the human body. Use of non-conductive materials set up an electrical current flow at the interface with the body. Won’t microwave radiation get underneath our RF shielding hats, or into the RF shielding hood through the face, then bounce around inside? 1) The radiation source hits the silver fabric. 2) 99.995% or more of this radiation is ‘reflected’ off the material. 3) Shielding/protective capacity from the fabric means that only 0.005% of the initial radiation gets through to the body and is absorbed into the body. 4) The tiny electrical field resulting from the 0.005% radiation is conducted by the body. Even without grounding, this level of electrical field is not sufficient enough to power the tiniest watch battery, less than 100th of a volt. 5) If a person were standing in the presence of wi-fi modem or cell tower, one could expect to absorb over 1,000,000 times the level of microwave as compared to wearing a protective shielding product such as we provide. 6) Microwave radiation is mostly absorbed by the skin. It does penetrate through the exposed face or skull, then bounce around inside the RF shielding hat or hood. Why can’t I test the efficacy of your shielding products using my cell phone or microwave meter? Periodically, we receive calls or emails with people saying: “I tested your product with my cell phone and it does not work because I could still receive a call or text.” Or, they used their microwave meter and could still see measurements on the meter when placed inside the RF shielding product. These inquiries are extremely taxing and time consuming for us. We understand and appreciate people wanting to be sure our products work, or being suspicious or inquisitive. However, to test our products, one needs an education on this complex subject as well as the correct equipment! Testing with a cell phone is absolutely not valid or accurate as explained below. When I was first considering representing these excellent shielding products, I used my EMFields Acousticom 2 microwave meter to test them. I was not impressed at all. I contacted the manufacturer telling him I was disappointed in the shielding quality. He simply asked me: “Are you using a ‘omni-directional’ meter?” I said, ‘yes.’ He then explained: “You cannot use an omni-directional meter because microwave radiation is bouncing around the environment from many directions and you cannot make a proper assessment of the product effectiveness in this way.” He told me to use a ‘uni-directional’ microwave meter. 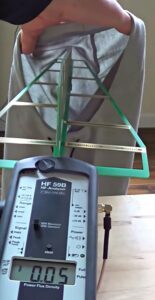 Thus, as you can see in the videos below from my YouTube Channel, I used an $1800, professional level, Gigahertz Solutions HFE59B, uni-directional RF/Microwave Analyzer to test the products. Immediately, the results were obvious! All claims and certifications provided by the manufacturer of these products were accurate. I had to increase my education on this subject and use the correct equipment for testing. How can a person possibly expect to test our products accurately by checking the signals or visible networks on their cellphone if placed inside our RF shielding hats, hoods or sleeping bags? Our products cannot be tested in this way. A cell phone will pick up a signal as low as 0.0000000002 microwatts per square centimeter. This is 2 billionth of a microwatt per square centimeter! Our shielding hood, for example, shields effectively to 99.995%. Even this incredibly effective shielding rating, a cell signal is still going to get through the fabric. This does not in any way invalidate the protective qualities and shielding effectiveness of our products. And when testing, is a person able to completely seal our RF shielding hood, hat or sleeping bag airtight? Absolutely not! 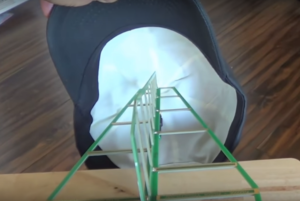 Thus, a gap of only 0.0001″ in the fabric would be enough to allow the cellphone to make the connection! In addition, our products are not being sold as a cellular phone shield. This is not what our products are for. Thus, using a cell phone to test our shielding products is not a valid or accurate test and will only lead to confusion. According to Barry Trower, an ex military microwave expert, a mobile phone uses many frequencies. Some of these are ELF (extreme low frequency) and will go through almost any materials except lead. Our products shield to the frequencies and levels stated on the testing and certification. Thus, using an apparatus, a cell phone for example, that transmits and receives outside of these levels and frequencies does not in any way prove that our products are not effective. 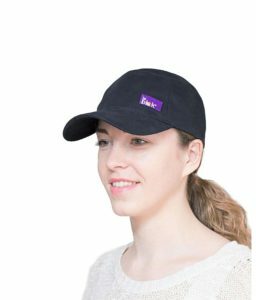 You may wear a cap of some sort inside the RF Shielding Headnet and this will extend the fabric and drape it around your head. Then simply tighten the drawstring a bit for a snug fit around the neck area. When using the RF Shielding Headnet for a wireless modem or router guard to cut down microwave radiation exposure, place it completely over the modem or router and tuck it in underneath the bottom of the unit. Or tighten up the drawstring around the wires in back of the modem/router. This will reduce the wireless radiation greatly. If this application reduces the wireless signal too much, you may loosen the fit and not tuck the fabric in so tightly under the bottom or backside of the modem/router. You can also adjust the fit to leave some opening in the fabric which will allow more wireless signal to leak through and reach your devices. Care: Delicate Machine Wash Only in cold water. Use only completely chemical free washing powder or liquid, no harsh detergents. Do not bleach. Do Not Hand-wash. Do Not Tumble Dry. Hang to Dry. Will your EMF shielding clothing stop the ringing in my ears? Will it protect me if I am a ‘targeted individual’? We make no claims that our products will stop this ringing in the ears. At this time, the entire planet is saturated with various types of unnatural, man-made EMF. The environment is no longer natural in any way and many of us are suffering the consequences of this corruption. We also receive inquiries from those who say they are ‘TI’ or ‘targeted individuals’, hoping our RF shielding hats and hoods will protect them. Again, we do not make any claims about this. The only information we can provide is that our products use the highest quality and highest shielding capacity fabrics to block a wide spectrum of microwave frequencies. 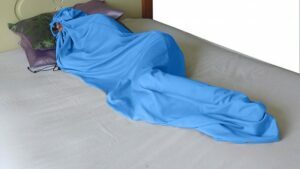 RF Shielding and Earthing/Grounding Sleeping Bag – What about the possible dangers of grounding? There are professional Building Biologists and others who suggest that grounding or earthing indoors is not always advantageous. And there may be some specific situations where this may be valid. However, as easily seen by testimonials from people around the world, most everyone feels better and healthier when grounding, even through the ground in AC wall outlet inside the home. 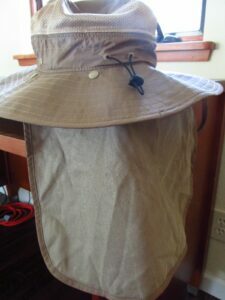 How do I wash or clean my RF shielding hats, clothing or sleeping bag? Delicate machine wash only at 90° F. Use only completely natural and chemical free washing powder or liquid. Do not bleach. Do not hand-wash. Do not tumble dry. Just hang to dry. Do not iron. By following these instructions, our products will maintain full shielding effectiveness for many years. We provide reference notes for exposure guidelines and an excellent 11-page training document with each purchase of a Microwave / Radio Frequency Meter. The exposure guidelines, which can be taped onto one meter, and the training document are very helpful for educating one in using their RF meter. Understand that people contact us continually, asking questions about using their meter, not even realizing they are expecting us to give them basic training! We cannot possibly meet these requests! This is why we provide the reference notes and training document. People still learning about measuring various forms of EMF are easily confused. Many times, in one’s confusion, one will blame the meter for being defective, too sensitive, and many other things people wrongly perceive because they have very little experience using an RF meter. It is best to know this: “The meter never lies. The meter is always right. The person using the meter is always wrong.” This seems a strange thing to say, but it is true. At first, people do not understand how to use an RF meter, nor do they understand how the meter reacts to various microwave exposure factors in different environments. Please take some time to read through the resources we provide with each meter, and practice using your meter in various environments. With just a little practice, you will become proficient using your meter! Testing Microwave/RF Shielding Hood with professional level RF analyzer. Testing Microwave/RF Shielding Baseball Hat with professional RF analyzer. 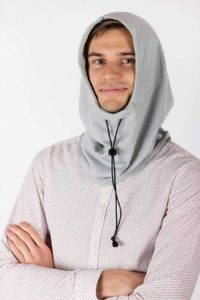 Microwave/RF Shielding Hood made from 50% silver fabric. Protects head, neck and thyroid areas. 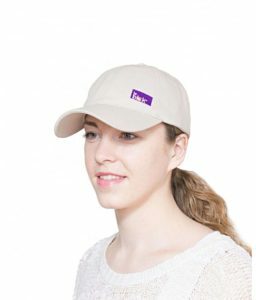 Microwave/RF Shielding Baseball Hat, nobody even knows what you are wearing! Microwave/RF Sleeping and Earthing/Grounding Bag. Extremely high shielding effectiveness when you cannot control the exposure levels in your environment. Microwave/RF Shielding Baseball Hat. Robust, quality shielding, blends right in without attracting attention. 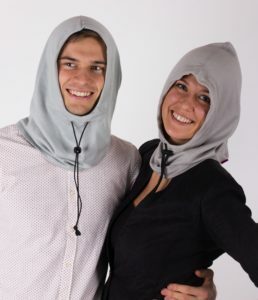 Microwave/RF Shielding Hood, protects head, neck and thyroid areas.